4 Important Facts to Know about Hit-and-Run Accidents in Denver CO.
Home|Blog|Motor Vehicle Accidents|Car Accidents|Hit-and-Runs|4 Important Facts to Know about Hit-and-Run Accidents in Denver CO.
Over the past few years, there has been a 13 percent increase in fatal hit-and-run accidents in the U.S.
Colorado ranks 10th when it comes to the most hit-and-run deaths in the U.S.
We’ll continue pointing out some important facts to know about hit-and-runs below. 1 – Hit-and-runs often involve pedestrian victims. Knowing the facts about hit-and-runs can help victims understand their best options for financial recovery, a Denver auto accident attorney notes. While this fact may underscore how drivers can panic and flee the scene after causing potentially fatal injuries to others, it also reveals how negligence can beget more negligent actions. Specifically, when drivers are negligent in paying attention to the road and cause accidents/hit pedestrians, they are far more likely to continue making bad decisions and acting negligently by, for instance, trying to flee the scene and avoid responsibility for their actions. 2 – Drivers flee accident scenes for a few different reasons. Panic is a big one, especially for those who know that they were breaking the law when they caused the collision. Another reason that drivers tend to flee the scene of an accident is that they believe that they have more to lose by staying at the accident scene than by trying to escape. Regardless of why drivers may choose to flee after traffic collisions, however, the fact remains that this action is a criminal offense that can be punishable by up to 6 years in prison (or more if the collision caused a death). 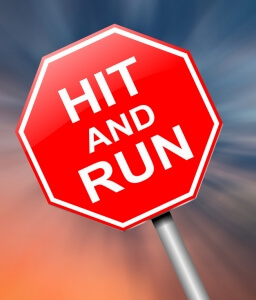 3 – There can be ways to try to track down motorists responsible for hit-and-runs. Law enforcement authorities can conduct investigations to try to nab the drivers who cause hit-and-run accidents; so too can attorneys for victims. Just some of the various methods that can be used to this end include a reliance on witness statements, surveillance footage (including from things like red light cameras), etc. So, the bottom line here is that it’s important to contact cops and a lawyer if you’ve been injured in a hit-and-run. These professionals may be able to ID and find the driver who caused the collision – and, then, hold that driver accounable. 4 – Even if the drivers who cause hit-and-runs can’t be tracked down, victims may still be able to get compensation for their accident-related losses. Unfortunately, some drivers who cause hit-and-runs will evade identification and capture. This, however, does not mean that victims are out of options for compensation for their collision-related injuries, losses and expenses. In fact, if victims have uninsured or underinsured motorist (UM/UIM) coverage, they can still pursue financial recovery via filing claims with their own insurers. To find out more about this process for securing compensation following a hit-and-run contact Bell & Pollock today. Contact an Experienced Denver Auto Accident Attorney at Bell & Pollock, P.C. Let our Denver attorneys put their skills, insight and resources to work helping you. To find out more about how we can help you after a hit-and-run or any type of traffic accident, call us at (303) 795-5900 or email our firm using the contact form on this page to schedule a free initial consultation with one of our lawyers. During this meeting, you will receive clear, honest legal advice about your case, your rights and your best options for moving forward.